The WSU Cougar football team finished 2018 at the Alamo Bowl with the win over Iowa State 28-26 and set the school record for the most wins (11-2) in history. The Cougs were led by grad transfer student Gardner Minshew (QB) in a year that seemed most improbable after the death of Tyler Hilinski, the QB heir apparent after Luke Falk who previously set school QB passing records the prior couple of years. Even former Coug great, Ryan Leaf (QB), predicted no more than 3 wins for WSU in 2018. Instead, Gardner Minshew, with the best mustache since Burt Reynolds, put the team and the Cougar Nation on his back and carried WSU to what best could be described as the “Year of Cougar Football. The Cougs will have to reload at several key positions for the 2018 foothball season after Luke Falk and several seniors departed for the NFL. The good news is Leach has recruited talent and many of the younger players are ready to step-up and make their names known to Coug fans. 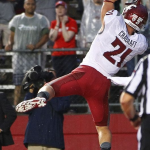 In one of the best game’s of his career, senior River Cracraft (WR) caught 9 balls, for 87 yards, and 3 touchdowns to lead the Cougs over Cal 56-21 for WSU’s 8th win of the season. WSU QB Luke Falk threw for 36/50 for 373 yards and five touchdowns in another dominate win for Washington State Fooball. 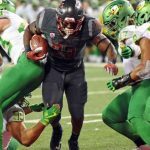 The #23 Cougars (8-2, 7-0 Pac-12) are now on their longest winning streak since 1930 and are a surprise contender to win the Pac-12 championship. Senior WR Gabe Marks broke the PAC12 all time career reception record with caught 295 career receptions on a 7 catches, 87 yards, and TD’s day making him one of the best to play for the Cougs. Marks along fellow receiver River Cracraft are expected to be NFL bound after completing their senior year at WSU. The Cougars will play Colorado, the PAC12 south leader, in a gems that has PAC 12 champion implications. No. 25 WSU continued its march through the PAC12 conference by dominating the Arizona State Sun Devils 69-7 for their seventh consecutive win. 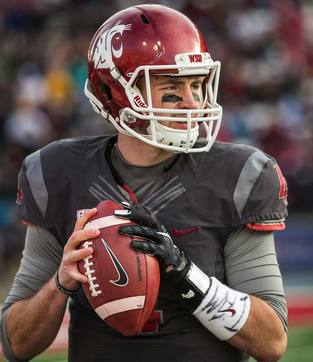 WSU QB Luke Falk threw for 311 yards and four touchdowns as Cougs put up 612 yrds of total offense. Cougs were playing so well that 2nd string QB Tyler Hilinski saw extended playing time and threw for 163 yrds, two touchdowns, with 15 of 17 completions. River Cracraft was WSU’s leading receiver with 2 catches, 1 TD for 90 yrds while Gabe Marks added 5 catches for 58 yards and 1 -TD. Not to be left out of the scoring action, WSU’s James Williams (RB) rushed 12 times, for 72 yrds, 2 -TD’s and Gerard Wicks (RB) ran 7 times for 44 yrds , 1-TD. WSU takes on CAL next week and will likely move up in the polls. WSU slept threw the first half of the game and allowed Oregon State to put up 24 points to their 6 points before waking up in the second half. In another comeback victory, Luke Falk (QB) threw for 415 yards and 5 touchdowns leaving Cougar fans to wake up with another PAC-12 win keeping WSU’s conference record 6-0 and bowl game eligible. WSU still on fire in the PAC- 12, beat ASU 37-32 on a warm desert night. Cougar quarterback Luke Falk threw for 398 yards and 3 TD’s and Robert Taylor (RB) aka @runitbackrob added to the TD total with a 100 yard kickoff return. WSU’s PAC 12 record remained perfect at 5-0 in conference play. The WSU Cougars rolled out their running game UCLA for a 27-21 victory in another big win for the program. Gerard Wicks rumbled for 2 rushing TD’s while Jamal Morrow ran for a 3rd TD. The Cougs added a FG to start and the end the game as WSU displayed its ability run the ball in Head Coach Mike’s Leach’s Air Raid Offense. 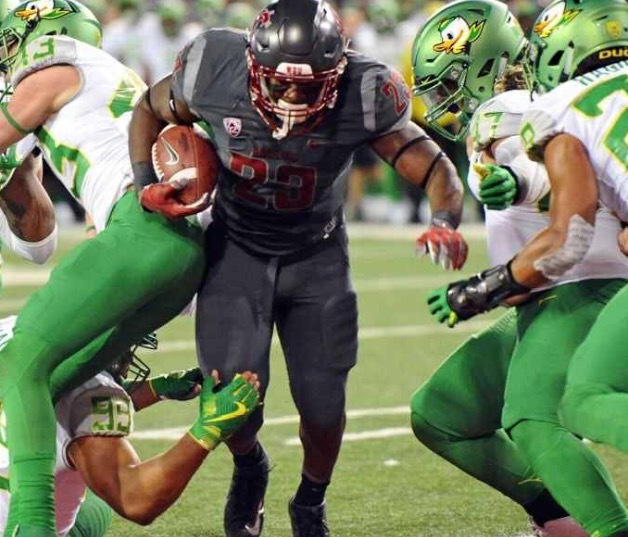 The WSU Cougars pounced on the Oregon Ducks and beat them 51-33 for their first 2016 Pac12 win. Playing in front of a sold out Martin Stadium largely crimson crowd, the WSU scored first on a Falk to Marks hookup and then scored 21 points in the 2nd and 4th quarter to put away the ducks with 651 yards of total offense. WSU QB Falk had a solid day throwing for 371 yards (38 /48) however it was the run game that really turned up the heat. The Cougs rushed for 280 years and 6 touchdowns on an Oregon team that was not respecting the ability of WSU to run. The ground game was lead by James Morrow (RB) who carried the ball 13 times for 122 yards (9.4 yds avg) and 2 touchdowns (TDs). James Williams (RB) also ran 11 times for 91 yards (8.3 yds avg) and 2 TD’s. Not to be outdone, Gerard Wicks (RB) also scored 2 TD’s on 11 carries for 60 yards leaving Oregon defenders in the dust. The WSU’s win over Oregon for the second year in a row put the rest of the PAC12 on notice that WSU is still a contender even after their early non-conference loses. 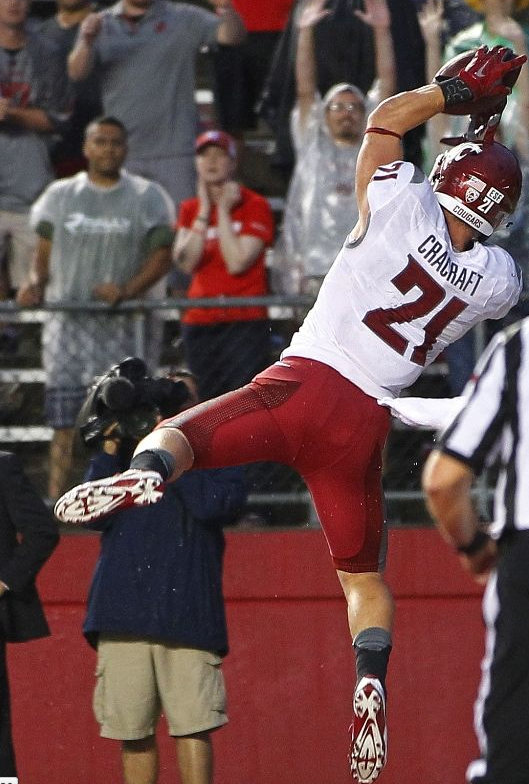 The Cougars, now 2-2 for the season, will take on #15 Stanford next week down on the farm. On a cold rainy day on the Palouse with 28,477 attendance, Washington State (WSU) ran over FBS neighbor University of Idaho (UI) for a 56-6 win. Uncharacteristically in the Mike Leach era, the Cougs ran for 228 yds led by Freshman James Williams (RB), who cruised for 126 yds and 1 TD. While WSU started slow 7-3 in first quarter, things picked up in the second with Marcellus Pippins’ 72 yd TD return on a blocked field goal from UI Erik Powell’s kick. WSU’s Luke Falk (QB) then got the passing offense going with an 8-yrd TD strike to his favorite target, Gabe Marks. WSU came back in the second half with a 14-play, 90 yds drive, and was capped off with Gerard Wicks’ 2-yrd run. The Cougs then turned up the offensive party in the 4th quarter with 4 touchdowns to seal the WSU win. While fun for Coug fans to watch, most were excited to see backup QB Tyler Hilinski play. Hilinski looked good moving the Cougs down the field. However, his first long ball TD strike ended with an Idaho interception. In the next series, Hilinski quickly led the Cougs on a 4-play, 55 yd drive, which was capped off with a Lee (RB) TD run to close out the game. WSU (1-2) has a bye week before the University of Oregon (2-1) comes to town. The Cougars will need that time to prepare for the Ducks, who lost a close game to Nebraska earlier in the day. In the meantime, Cougar fans and players will have time to enjoy a nice highlight reel featuring big time plays from Saturday’s game. 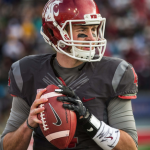 Game Notes: Luke Falk (QB) was 21/36, threw for 226 yds and 3 TD’s. James Williams (RB) ran for 126 yds, 9 yds per carry, and 1 TD. Kyle Sweet, (WR) had 4 receptions for 77 yds and 1 TD. Gabe Marks had 7 receptions on 59 yds and 1 TD. Marcellus Pippins 72 yd TD return on a block field goal. Tyler Hilinski (QB) was 6/8, threw for 55 yds, and had 1 interception.